Dallying In The Dirt, Issue #163 --- I watched the ponds thawing while pruning the trees. I wrote about pruning the Crab Apple tree a couple of weeks ago but I actually did it this morning. The sun shone, the temperature was almost pleasant and I finally felt like venturing outside for more than a few minutes. I do try to go out once a week to ski but it’s hard to prune a tree in your ski suit. The snow has melted enough that I could get to the front yard trellises and take down the Christmas decorations. 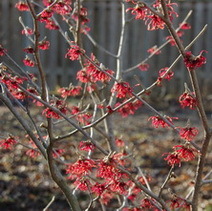 Finally today the witch Hazel was starting to bloom and it was warm enough to actually watch the snow melt. Two of the ponds have large holes in the ice and I can see some fish slowly moving around. The lower pond is still frozen solid and upon investigation I found a leak in the air hose above the ice so that the bubbler has not been working for some time. Through the ice I seem to be able to see a few dead fish. The bubbler is important to their survival. The ice on the bottom pond is still at least 15cm (6in) thick. Hopefully some of the fish in that pond have survived because it was probably the pond with the most fish in it. They have a tendency during the summer to go downstream and wind up in that lower pond. I spent last Saturday at the local mall participating in the city’s sustainability day. I answer questions and demonstrate seed planting techniques for about 8 hours. Apart from a rather sore back and the fun of getting people excited about vegetable gardening and starting their own seeds, I manage to get all of my Tomato, Pepper and Eggplant seeds into the soil. It’s about 8 weeks before the first of June when those plants will want to go into the garden. 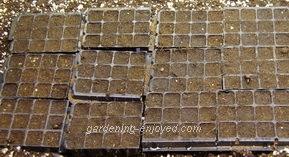 I had about 6 varieties of each to plant and I brought them home from the mall and put them onto my germination bed. I expect the Tomatoes to respond to the heat they find there and be up in less than a week. The Peppers and Eggplants will probably take a few days longer. The three Tomato seeds that I planted for a video a few weeks ago are now the perfect size to move to the garden and I will have to move them up to larger pots and try to keep them growing for another 6 weeks. Maybe I’ll have the first ripe Tomatoes in the neighbourhood. The sun was still shining when I finished pruning the Crab Apple so I wandered around to the front yard and looked at the Harlequin Maple This delightful white and green variegated maple is both a curse and a blessing. It is one of the Assistant Gardener’s favourite trees and we planted our first one on a special day many years ago. When we moved to our current home we planted a new one. It is still a gorgeous tree but it is too big for the space it has been allocated. 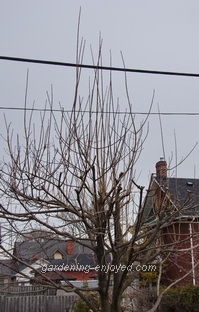 That requires a severe pruning every year to keep it confined to its allotted space. This tree can actually put out vertical shoots each year that exceed 3 m (10ft) in length. The more years I prune it the bigger the root system develops allowing it to grow even more the next year, creating an even bigger pruning job. I think this is what they mean by a vicious circle. Geryl Asks? I liked the begonias you grew last year from seed and thought I would try growing my own. I purchased Santa Cruz Sunset from William Dam Seeds. I planted them the beginning of March and wondered why they never germinated. I finally decided to review the back issues of Dallying and saw the word "covered" (I've had them under the light like the other seeds I have germinated). They are now covered. Do you think they will still germinate? I know it is late now but do you think I may still have some luck with them. By the way, I have one lonely little green speck. Should I transplant that and put it under a light? Ken Answers! I found these seeds relatively easy to germinate. They were just barely covered with soil and then put under the lights. Make sure their soil is warm 75F at least and that should speed the process. Don't hurry to transplant that tiny green speck just put the covering soil around it and not over it.